Nick Clegg is so nice! 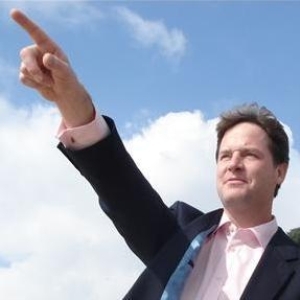 Though we are impartial at TMP, we have to admit that Nick “Calamity” Clegg has done well. Before the leadership debates less than 10% of the public thought he could be prime minister. He had to plaster a picture of himself next to St Vince Cable on the Lib Dem battle bus just for Joe Public to realise which party he was in. However since his shining performance at the first debate, his popularity skyrocketed, the media loved him,Â he was dubbed “the British Obama” by some hysterical elements of the liberal press, even right-wing female hacks have claimed to fancying “No more than 30 women” Nick. In the following two debates, Nick’s shine started to fade, his familiarity and friendliness became more stale and repeated. His ratings slowly dwindled as he asked the public to “do things differently” and despite Conservative Party scaremongering they did. Would you vote for this? The electorate decided grant Nick Clegg and the Liberal Democrats, a return to the House of Commons with five fewer MPs, resulting in the admirable Dr Evan Harris being unseated and the good people of Montgomeryshire deciding that they no longer wanted the Daily Sport columnist and alleged womaniser, Lembit Opik representing them. Nick was so upset by the loss of Lembit, he was visibly upset when he made his election speech and shortly afterwards dodged the press and also refused to talk the media for a few hours resulting in Newsnight’s Kirsty Wark sulking by herself on a train. No doubt due to Clegg being unbelieveably nice and dreamy, at 2.30pm on Friday 7th May, Cameron started to woo him and the Liberals to join his gang and lead “a strong and stable government” which would represent the overwhemingly majority of the vote. Nick Clegg stood by his pledge to speak (but not form a government) with the party with the largest mandate, and this positive response was cooed by Digby Jones as “an act of statesmanship”. Brown has been cooing the Lib Dems even before the election and who knows how long the Labour Party have been debating and preparing for this outcome.Â So it has been a flirt here, playing hard to get there from Nice Nick with very little to show for it. After Clegg’s agreement to start formal talks with the Labour Party, Clegg’s Lib Dems has gone from being nice and statesmanlike to “double-crossing, two-faced shysters”. From zero to hero, Clegg has become the most powerful man in British politics. That’s according to Mervyn King, Governor of the Bank of England… but what does he know about macro-economic policy? Swiftly despatched emergency budget served with an age of austerity anyone? @justinthelibsoc can’t say I enjoyed that blog, Justin. @justinthelibsoc was petty, juvenille lacking a decent sense of humour or substance. @justinthelibsoc I like you, Justin. You’re a swell guy. Don’t let her get you down. @jlukeroberts I never trust anyone who calls me “swell”, it’s like they are secretly wishing for me to spontaneously combust. @justinthelibsoc You’re a real brick? @justinthelibsoc I wish I was called Lord Adonis. @justinthelibsoc and more seriously (though I am serious about Adonis), I’m sure they’d love a Lib-Lab but numbers simply not enough.